The role of women, and the way they are represented on the lapidars in the Albanian revolution and the construction of Socialism, is one of things that make Albanian Socialist Realism quite unique. It is also a lesson for future artists following the next wave of proletarian revolutions. I have attempted to bring this out in my close reading of the lapidars posted to date and will continue to do so in the future. However, sometimes it’s useful to take a step away from the particular and make a similar analysis of ‘works of art’ created under conditions of capitalism. Such an exercise demonstrates how far art in Albania developed in the few years (46) that Socialism existed in that country. 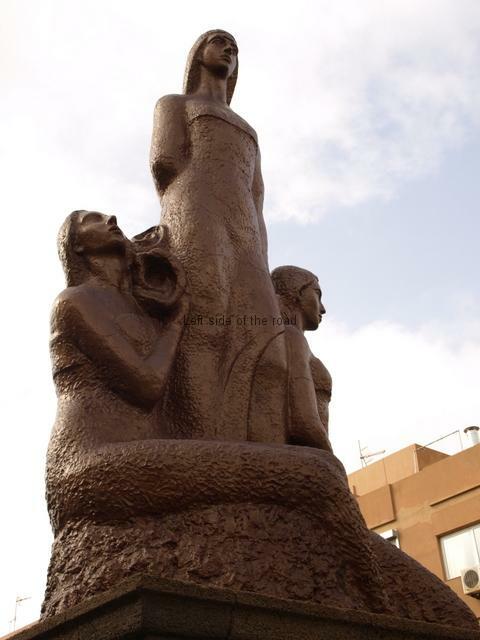 For this counter-analysis I have chosen a statue in the town of Gáldar in Gran Canaria called ‘El Monumento a las Guayarminas’ – The Monument to the ‘Indigenous Princesses’. Before looking at the statue in detail perhaps it will be useful to give a bit of background to the first inhabitants of the seven Canary Islands, a people who are now referred to as the Guanches. That was almost certainly not the name they used to describe themselves, most people calling themselves words in their own languages that more approximate to ‘the chosen’, ‘the humans’ or ‘the people’ rather than anything more specific. All peoples really have been given their names by others, normally their enemies, so those names, which have now stuck, tend to be derogatory in translation. But then people don’t really look to deep into their own origins. Everything seems to have gone quite well until the Spanish decided to expand its empire but it doesn’t seem to have been that easy. The Spanish ‘Conquest’ took place throughout the 15th century, they only being fully in control of all the Canary Islands in 1496. In the process, in fine imperialist style, the Guanche culture, way of life and language was totally destroyed, the people being either killed or sold into slavery and their memory being effectively obliterated from history – a strategy the Spanish followed over the next two centuries in what is now known as Central and Latin America. As an aside it is worth mentioning that, although unplanned by the Spanish, the conquest of the Canary Islands played a vital role in, first, Christopher Columbus’s first voyage of ‘discovery’ of America and the subsequent sacking and robbery of that continent over the next three hundred years. It was in the town that is now known as San Sebastian, in La Gomera, that was the last place of call (to stock up on fresh water) for Columbus’s three tiny ships before they set out to find a short cut to India. Unfortunately for the indigenous people, of what is now known as the Americas, their home was in the way. Most of the thousands of Spanish ships which were to make that voyage in the succeeding centuries used the Canaries as such a staging post. Like many imperialist nations, to whom genocide was part and parcel of conquest, when it’s too late to do anything about it, they attempt to salve their consciences by making a mock recognition of their past crimes and paying lip service to respecting the culture they had previously, happily, destroyed. It isn’t a coincidence that this plays well in the present era of ‘political correctness’ and the world of tourism – the industry upon which the Canaries will either sink or swim. We should always remember the qualification that we should be aware of, and know how to tell the difference between, those who ‘speak well but mean bad and those who speak bad but mean well’. And it is in this environment that we have to place the statue of the Monument to Las Guayarminas. 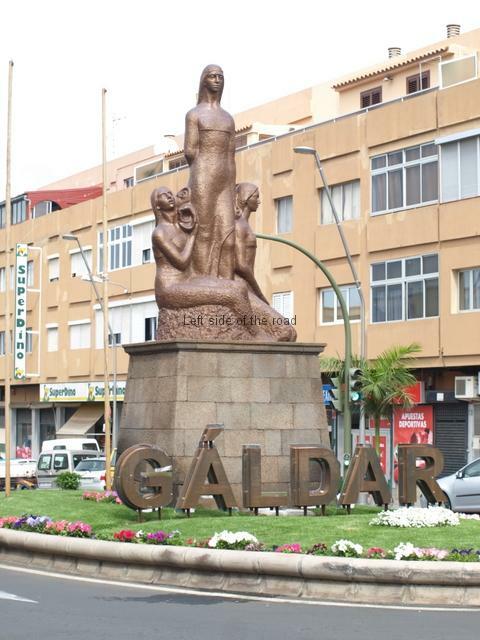 So in 1981, I assume the municipality of Gáldar, commissioned a local sculptor, Borges Linares, to create a public work of art to celebrate, commemorate, the slaughter, rapine, enslavement and virtual ‘ethnic cleansing’ of the Guanche people. It’s here we start to see the separation of capitalist, imperialist, ‘justification’ art from the forward-looking, progressive, proletarian art that I have been writing about in the posts on the Albanian lapidars. First its location. The statue and its plinth stand on a small, raised traffic island at the entrance to the commercial part of the town. 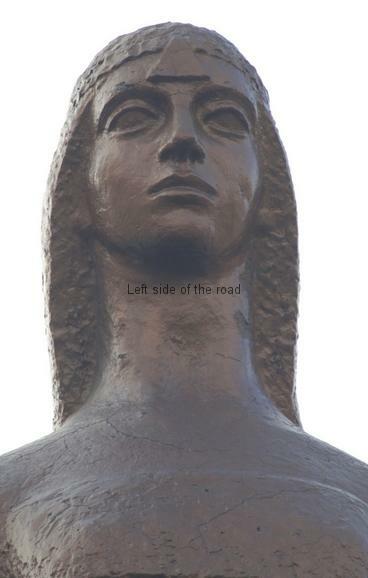 To get a good view of it you have to step up on to the grass from the road and the statue is in no way ‘accessible’. The plinth is about 2 metres high so that even more separates the figures from the viewer. Now, I’m quite happy about that. This is the type of statue that most people who pass it everyday couldn’t tell you anything about it in detail. However, by placing the statue in this location there’s an implied ‘look don’t touch’ message. This is what can be seen in the UK with those royal equestrian statues and any such representation of past kings or queens. It’s not for the hoi polloi to be able to touch such ‘sacred beings’. For the ‘peasants’ looking up, hopefully in some form of ignorant respect, it is the only way to appreciate such creations. Then we have the name. The translation tells us this is a monument to three Guanche ‘princesses’. This demonstrates the first of the many banal aspects of this ‘work of art’. Why princesses? For more than two thousand years a vibrant culture existed on the seven Canary Islands. It appears they were able to feed, clothe and house themselves relatively successfully. There seems to be evidence of a collective element in the storage of the basic food grains, principally barley (from which they made a staple called ‘gofio’). At the same time there was a hierarchy of wealth and power – which seems to have been tolerated in primitive societies as it is in most societies up to the present day – forelock tugging being an innate attribute of most individuals. In Albanian Socialist Realism it’s the working class men and women who are celebrated and recognised for their contribution to the Liberation of the country from Fascism, the Revolution and the construction of Socialism. In the sham ‘recognition’ of the Guanche the chosen are the ruling class, about which virtually nothing is known. In Europe there are princesses so there must have been the same in the Guanche culture. The Euro-centric view of society and history is thereby reinforced. They are tall, slim, ‘regal’ – banal. They represent and say nothing. They are there, that’s all. Static, without purpose, parasitic, doing nothing. Like the present aristocracy, in countries like Britain, where the ignorant flag-waving monarchists, with their obsession with the Saxe-Coberg and Gotha family – which changed its name to Windsor in 1914 so the British workers and peasants that went to die in the war against Germany wouldn’t know that their monarchy was also German – continue to fawn and kowtow to a rich family of thieves whilst their miserable lives get worse due the effects of ‘austerity’. The women of Albania fought, they took up arms with the men, they were equal, nay, more than equal to those slavish Nationalist quislings who sat down with the Fascist invaders. 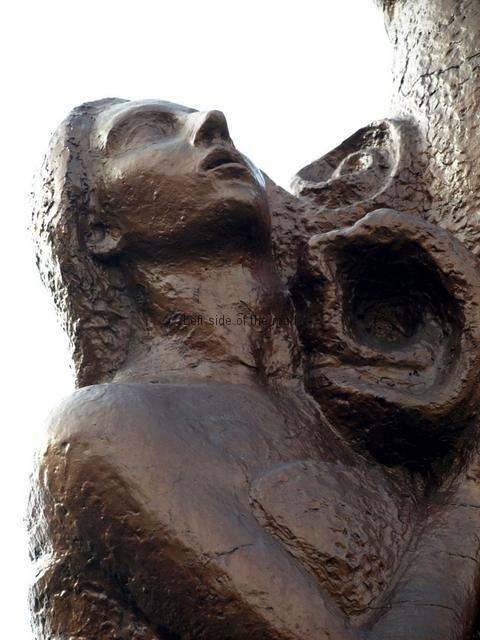 In Albania we have the example of the likes of Liri Gero, a brave teenager, a young peasant woman with a long-term perspective, tortured and murdered by the Nazis – as a ‘lesson’ to those who dare to fight for Freedom (the meaning of her name). The Spanish Conquistadors had such contempt for those peoples whose land they stole that they didn’t keep comprehensive records of the culture they were hell-bent on destroying. The Guanche don’t seem to have been a particularly warring culture and would have to had learnt quickly how to deal with the invaders. They also seemed not to have developed any form of written or pictorial version of their language in which their history could be recorded. If there’s any evidence that women took part in the fighting I have yet to encounter such material. However, even if they did not actually take part in combat they would have kept their society running as smoothly as possible as the men were away, by working in the fields. As I write that I start to wonder why it took women, from all over the world, so long, when faced with war and invasion where they would have suffered physically if their ‘side’ had lost, didn’t actually take part in the battles. Not all fighting has to depend upon physical strength. In fact those tactics of ‘guerrilla warfare’ developed by Chairman Mao actually favour intelligence and guile rather than brute force. A patriarchal society doesn’t provide all the answers. It wasn’t until the Paris Commune of 1871 (the 146th anniversary of which was commemorated on March 18th last) that working class women first took a concerted and active part in the struggle for the betterment of their class in opposition to the established state. For their pains they were murdered and buried alive by the ignorant peasant army of Versailles in the last week of May of that year. Fighting a rearguard action the Women Incendiaries, such as Louise Michel, aimed to delay the inevitable and to leave a destroyed Paris to the victors – concerned more with property than human lives. However, it wasn’t until the first Socialist revolution, led by an ideologically clear and organised Marxist Party (the Bolsheviks who were later to become the Communist Party of the Soviet Union) in the October Revolution in Russia in 1917, that women first started to play a real role in the fight for the liberation of the working class. This role became even more important and politically relevant during the anti-Fascist and National Liberation Wars after 1939 in those countries where the struggle was led by Communist Parties – especially in the Soviet Union, China, Albania and Vietnam. But in the 15th century the Guanche hadn’t had the opportunity to learn this lesson and they were virtually annihilated. Instead of investigating and considering anti-Spanish resistance as the theme of his statue Linares decided on the ‘safe’ option, the option that wouldn’t in anyway rattle the status quo or the establishment. As stated before, the totally banal. Volcanic islands are, by definition, mountainous and this is represented in the statue with the lower two princesses representing the foothills while the standing, central female representing the highest peak. This also alludes to the idea of royalty being the pinnacle of any society. Here it seems appropriate to make a comment on the features of the females represented on this statue – and also in the other Canarian representations of the Guanche I’ve encountered. This is important as it indicates how serious the Spanish victors are about the whole of this restitution of history. Remember that the Guanche are generally accepted to have arrived from North Africa. It might be my eyesight but I can’t see anything North African in the features of these three Guanche ‘princesses’. The Northern Africa population today display a mixture of Arabic and Negroid features. These people have been mixing for thousands of years. The northern Caucasians would also be in the mix but due to the very nature of their location they would have had a minor impact upon the features of the population. That is now, I would consider it to have been even less in the past, that is, 600 years ago. So why do these three women, as well as the people in the God-awful videos in the ‘Cueva Pintada’ Museum video presentations, look distinctively Spanish, or, at least Northern European/Caucasian? This is all part of the ‘revisionist’ version of the past. There’s a contradiction in present day society. Metropolitan cities are praised yet the homogenisation that results from this is not considered to be an issue. It leads to an idea that we are ‘all the same’ but this doesn’t work when we look at the past. Especially those cultures that have been destroyed by a stronger – or at least more vicious (and often also supported by convenient diseases to which the indigenous population are not immune.) There is also the fact that such Metropolitanism misses the vast proportion of the world’s population and they wouldn’t know it if they saw it. Why is it that big city centralism is celebrated throughout the world but at the same time billions of people are living in abject poverty? What we have in this statue is realisation of a dead culture which is represented by the images of the culture that killed it – and to which it has never been brought to book. These women have no Northern African features whatsoever, they look more Spanish, European. More like the invaders of 600 years ago. Those same invaders ‘celebrate’ those they destroyed by making a statue that looks more like the murderers than the victims. If you look at the ‘principal’ princess she looks like something from a video game. She bears no relation to a real person. She’s more like Linda Carter’s version of ‘Wonder Woman’ – but without the ability to fight – even down to the triangle on her headband. Her hair extends halfway down her back but it’s difficult to make out as the three women merge into each other, emphasising their lack of individuality. Also this principal ‘princess’ just stares out ahead of her, she looks catatonic, there’s no animation in her stance. She also wears a totally impractical dress, full body length, with a slit that starts above her knee, the only indication of anything that approximates something living. The statue is called the three princesses but the other two females that are part of the structure seem more to be servants than equals. The one on the right looks out at rights angles to her more prominent sister. What she shares is the vacant, empty look. She is dressed in virtually the same style as the standing woman but one thing that’s emphasised by her stance is the inability of Linares to sculpt hands. Or feet. All these difficult appendages to the human body all merge into a shapeless mess. What also differentiates the standing ‘princess’ with the others is the lack of a triangle on the forehead. So surely a sign of different social standing. I have problems with the woman on the left. She’s also much lower but whereas the one on the right is kneeling the one on the left seems to be sitting down, her hidden legs (almost Mermaid like) covering the feet of the most important. She doesn’t stare into nothingness, she looks up, in a way that indicates suffering rather than anything pleasant. Although there are three women this statue owes more to those of images of the Crucifixion of Christ than anything original – or Pre-Conquest. This third woman is also different in that she has something that looks like a couple of conch shells on her shoulder, resting them against the thigh of the standing ‘princess’. I don’t know. Perhaps she’s waiting for a message. Or has just received one that is so shocking that it is the reason for her surprised look. One of the aspects of Albanian lapidars that I have mentioned a number of times – in praise – is that the name of the artist doesn’t appear on the sculpture. I like this indication of a lack of possession but at the same time I believe these Socialist artists should be attributed for their skill, but not on the work itself. The destruction of the archives of the Albanian League of Writers and Artists was a tragic consequence of the 1990s Counter Revolution. Because many of the lapidars were not ‘signed’ now it’s not so easy to learn who the sculptors were. 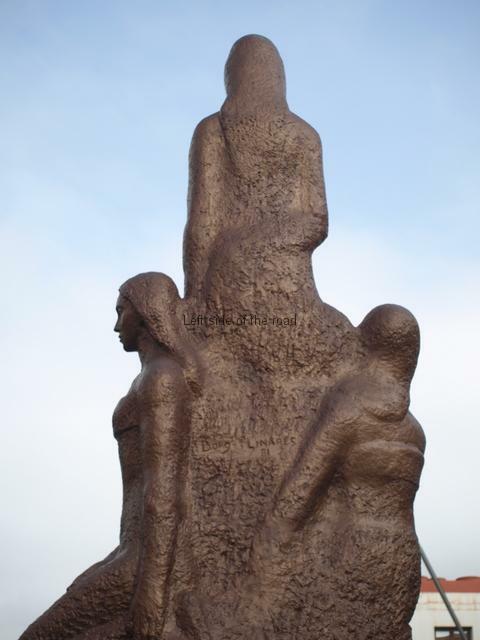 However, in the case of the sculpture in Gáldar we know exactly who was the sculptor as he vandalises his own work by placing his name in the middle of the backs of the three women. He doesn’t chose a discreet location on the plinth, but in a place that is totally inappropriate. The ideas that separate this sculpture from those of the Albanian lapidars demonstrate, without a shadow of a doubt, the difference between the capitalist and socialist systems. 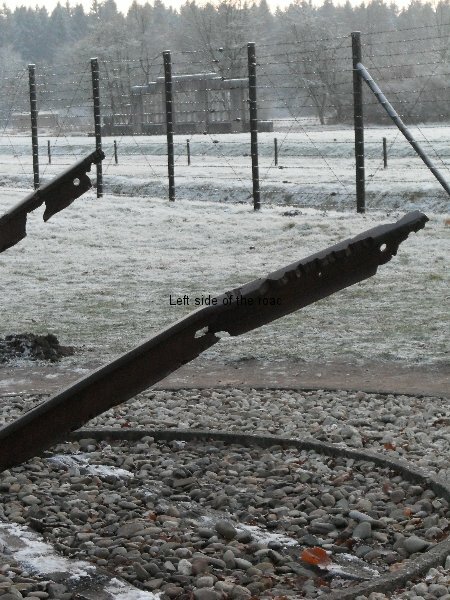 Established in the north-east corner of the Netherlands, Westerbork reverted from being a place of refuge to a transit area towards the death camps during the Nazi Occupation during the Second World War. 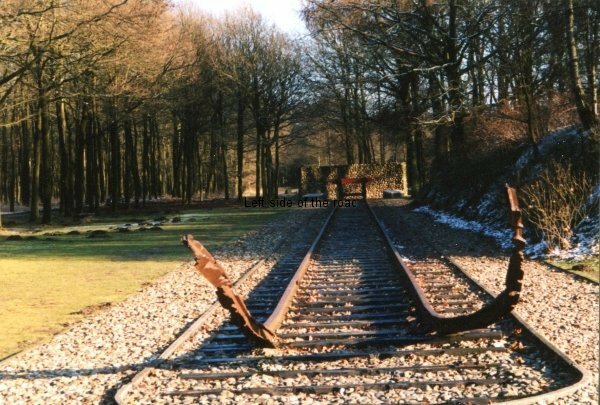 Westerbork was opened in October 1939 to accommodate refugees that had been coming from Germany since Hitler’s success in the 1933 elections. In subsequent years more and more refugees arrived, perhaps with the same hope as the Dutch seemed to hold as the war clouds grew over Europe, that the Netherlands would remain neutral. However, instead of being welcomed by the Dutch indigenous Jewish community these refugees from Germany were considered as ‘parasites’, making the future plans of persecution and extermination a much easier task for the Fascists. (As an aside here it’s worth making reference to the words written by a German Protestant Pastor Martin Niemöller. He was an anti-Communist who, at first, supported Hitler’s rise to power in 1933 but began to see that he might had made a somewhat serious error of judgement. 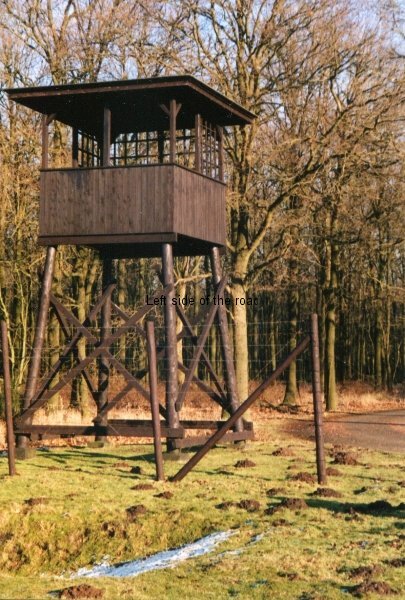 The physical location of Westerbork (one of 26 such camps at one time) indicates the segregation that the Dutch sought to impose on the German immigrants – it’s in an isolated area now and would have been even more so in the 1940s. All this background made it easy for the Fascist invaders to carry out their plans against ‘undesirables’ once the camps were taken from Dutch control in July 1942. 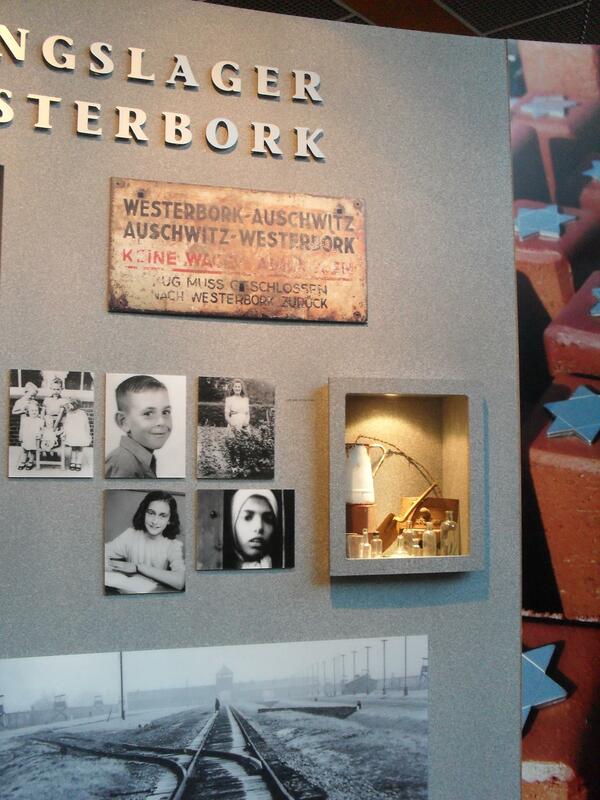 For almost three years there had been a strange atmosphere in Westerbork. Religious ceremonies took place there, including weddings, and there were cultural and sporting activities and there was even a system of Jews policing themselves. 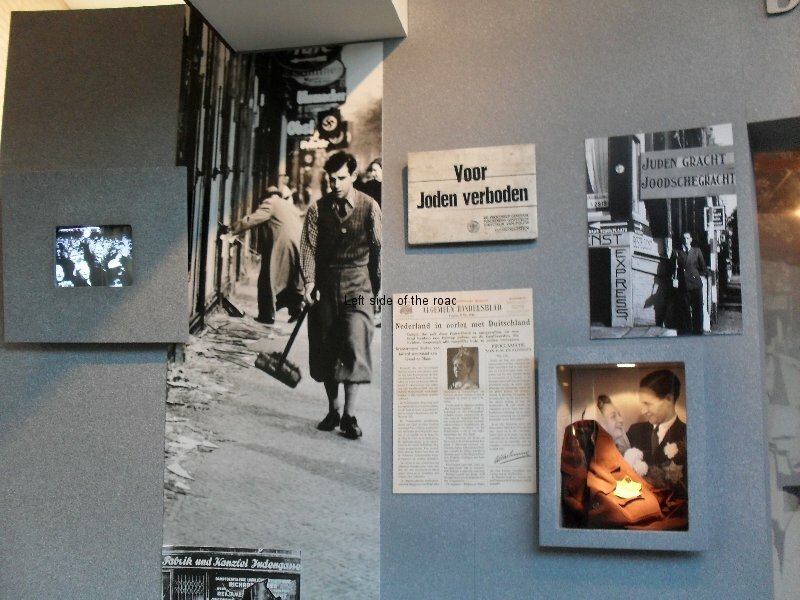 As it subsequently became a stopping place to the death camps it’s a bit disconcerting to see photos of smiling inmates in the Westerbork museum. 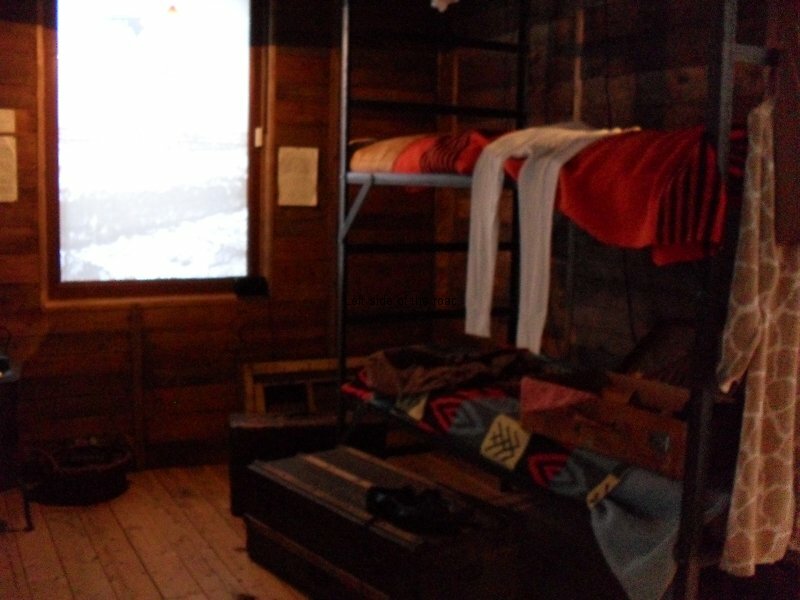 The small museum contains an interesting collection of photographs, signs that would have been used in the administration of the camp which provided a sense of normality as well as a reconstruction of part of the living accommodation. In the first months of SS control those being deported had to walk to the nearest railway station, about 3 kms away, but by the end of 1942 a spur had been built so that the cattle trucks could be driven directly into the camp – the end of this line is now one of the memorials in the camp area. Tuesday was the set day for deportation and the anticipation became a source of fear. Eventually more than 102,000 Jews and 250 Sinti were deported, the majority to Auschwitz and Sobibor in Poland, never to return. 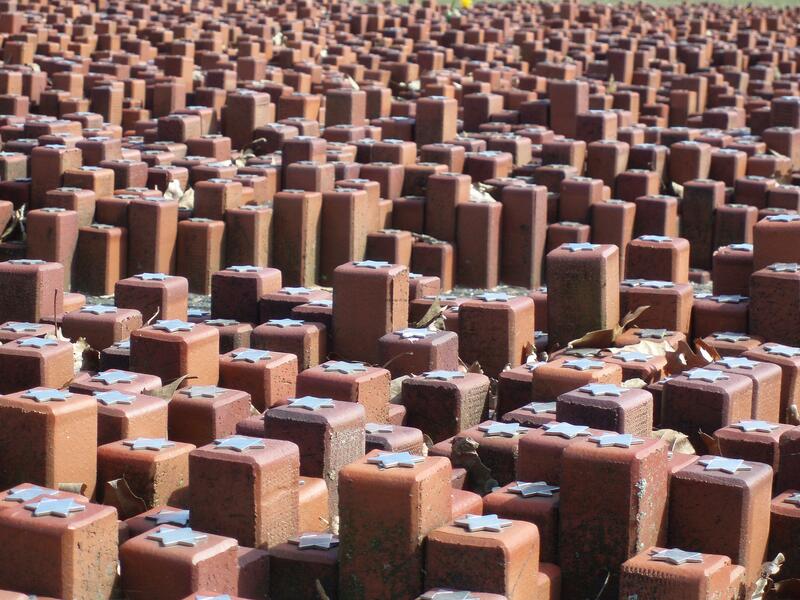 On what used to be the parade ground are 102,000 upended bricks to commemorate these individuals. An issue which throws up a number of questions is that it was the Jewish ‘governing’ body that administered the deportation process and selected those who were to be deported. Many of the photos that have survived show the active participation of the Jewish police in this process, even carrying an old woman on a stretcher to the cattle trucks. The argument that they did this to avoid deportation themselves is no excuse. 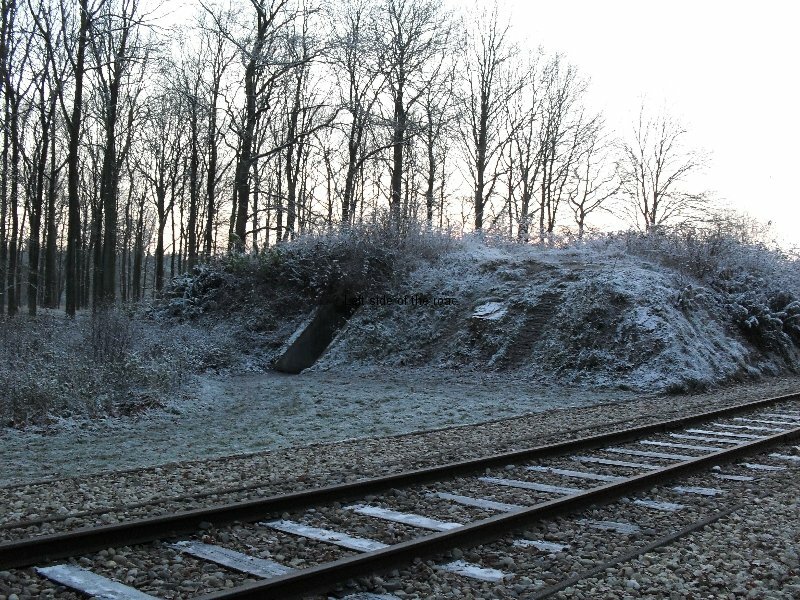 It stands as a fallacy side by side the argument of those German soldiers who were at the other end of the railway line, at the extermination camps, that they were ‘just obeying orders’. 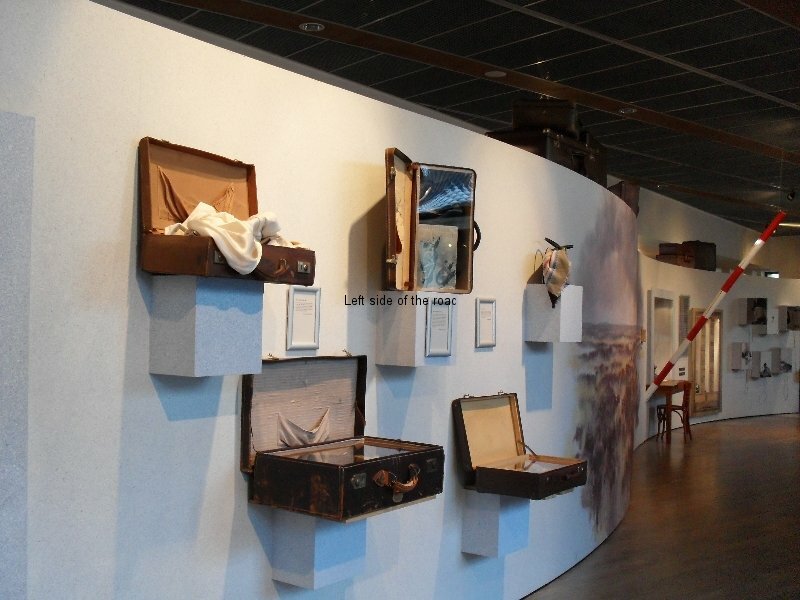 A total of 93 transports left the camp, the last on September 13, 1944. This last train carried 279 prisoners including Anne Frank and her family. 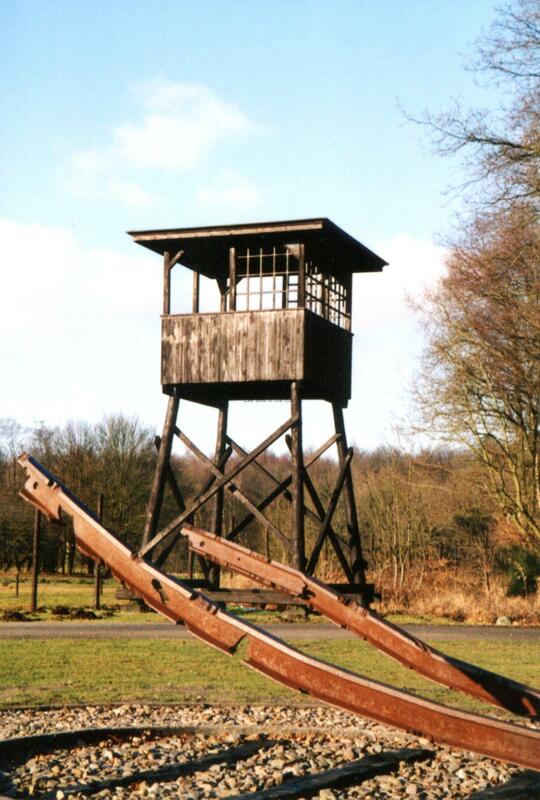 On 12 April 1945 the camp was liberated by the Canadians and at that time there were still 876 prisoners in the camp. Previous to liberation the SS and Dutch collaborators had fled to the north. Official website of the Westerbork Monument and Museum. By train it’s not easy and would entail at least one (possibly two) changes to get to Beilen from Amsterdam. From Beilen the bus to Assen (number 23 – one an hour) would take you to Hooghalen Centrum, from where it’s a couple of kilometres to the entrance of the complex and the museum. The Memorial site is another couple of miles from the car park by the museum, but there’s a mini bus service to take you there every 20 minutes – whilst the museum is open – single € 1.5, return € 2.00. 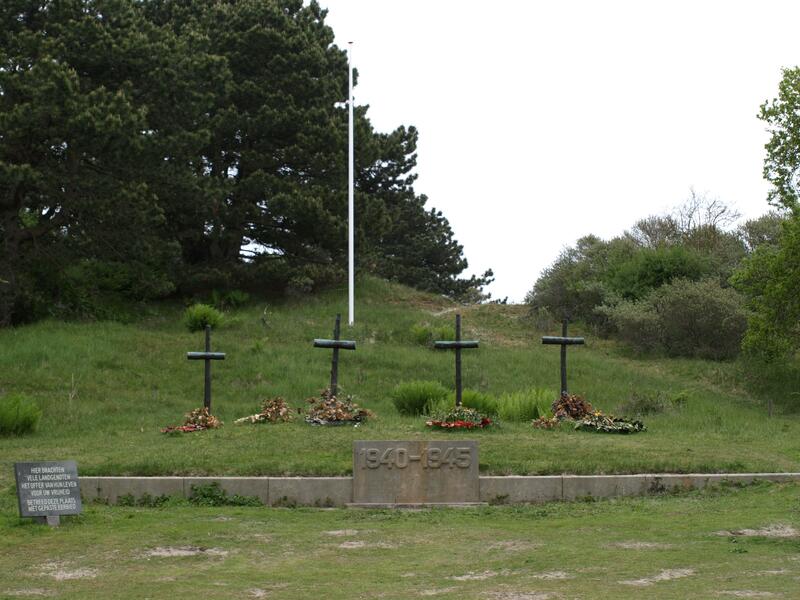 The simple memorial at Waalsdorpervlakte, in southern Holland, to Resistance fighters murdered by the Fascists during the Second World War, is a place for the people to remember and celebrate the sacrifices made to liberate their country. Second World War memorial sites have a different meaning in Europe to those that commemorate the event in the UK – they’re more immediate. In Britain direct experience of war for the civilian population was limited to whatever might rain down on them from the air whereas huge parts of Europe were totally devastated in the conflict, most especially the Soviet Union, and invasion and its consequences were an everyday matter in all those countries occupied by Fascist forces. Most of the western European countries capitulated within days and as a result physical damage to the major cities was minimal. For example, both Paris and Amsterdam suffered less destruction than London (and many other British cities) even though France and The Netherlands lost their independence through the German occupation. Quick capitulation, pro-Fascists internally and the attitude of the Nazis that the French and the Dutch were Aryans (unless you were a Communist, Jew, Gypsy or homosexual) meant that the local population were not unduly mistreated by the invaders – as long as they played along with the occupiers. The situation was very different in the east. Just look at pictures of German officers walking around the Eiffel Tower with French women on their arms or boat loads of German soldiers playing at tourists – doing 70 years ago what thousands of tourist do today – looking at Amsterdam’s attractions from the canals. Compare that with the Soviet Union where the only pictures of Germans with Russian women is when they are standing beside a gibbet with a line of Soviet citizens hanging from a short rope, indicating a slow strangulation rather than an ‘efficient’ hanging. In France and Holland most accepted the occupation and kept their heads down, not wishing to court trouble; some were out-and-out collaborators – and from that number some paid the price at the end of the war whilst others went on to positions of power and influence in the post-war reconstruction; others actively fought in the Resistance at various levels, from taking up arms to hiding those being sought by the Gestapo. But the price for being in the last group could mean death. 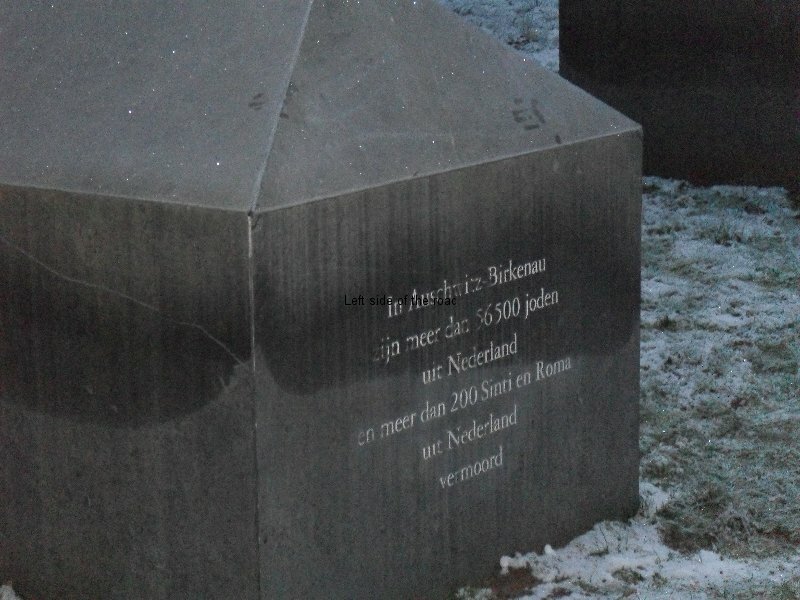 And for 250-280 Dutch Resistance fighters their last stand of defiance would be where they would be buried. The Waalsdorpervlakte is an open place in the dune area “Meijendel” not far from The Hague (the government and administrative centre of Holland). This area, close to the sea, is relatively isolated today and would have been even more so in the 1940s. 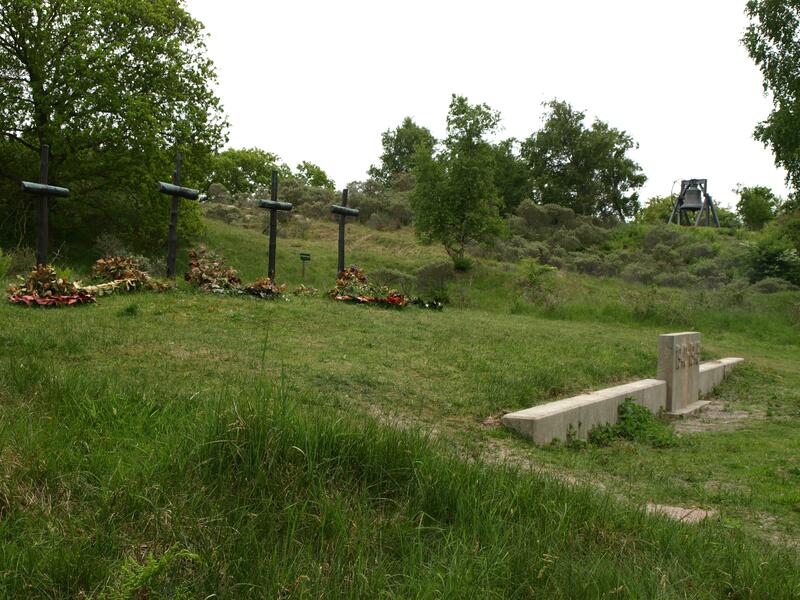 Prisoners were brought here, shot and then buried in unmarked graves. 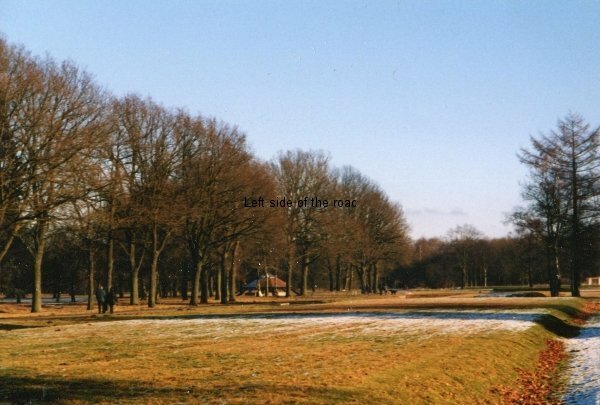 Not by chance this was also the execution site of the Anton Mussert, one of the founders of the National Socialist Movement in the Netherlands (NSB) and its formal leader. On the defeat of the Nazis he was arrested, convicted of high treason and sentenced to death. 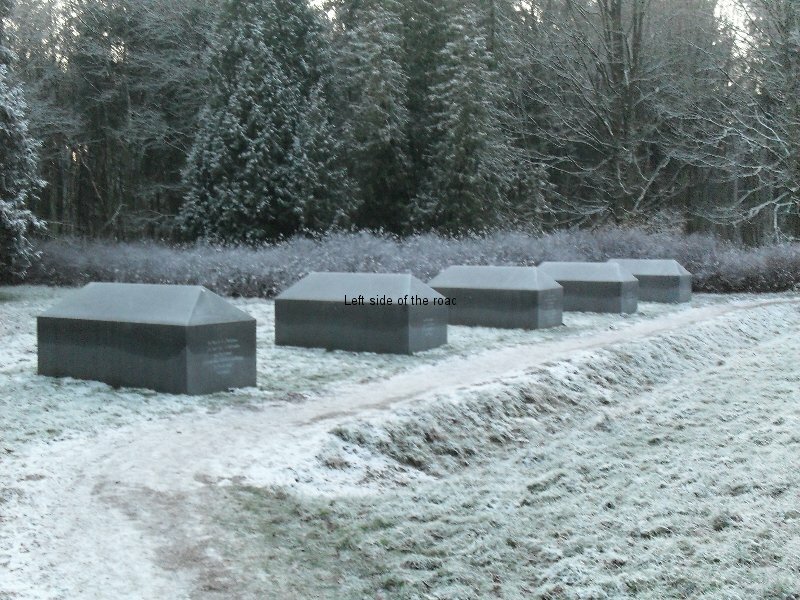 Exactly a year after he was arrested he faced a similar firing squad to the Resistance fighters but was buried in a public cemetery, there being no desire to pollute the most recent of Holland’s memorial sites. After the war May 4th was declared the day for the ‘Remembrance of the Dead’ and almost spontaneously, and without any official government input, survivors of the Resistance and relatives of those murdered there decided to congregate and commemorate their lives. Although this has now turned into a ritual it still retains its common approach. There are no VIPs (except any remaining survivors and relatives of those assumed to be buried there), no speeches and it’s for anyone who wishes to turn up to take part. 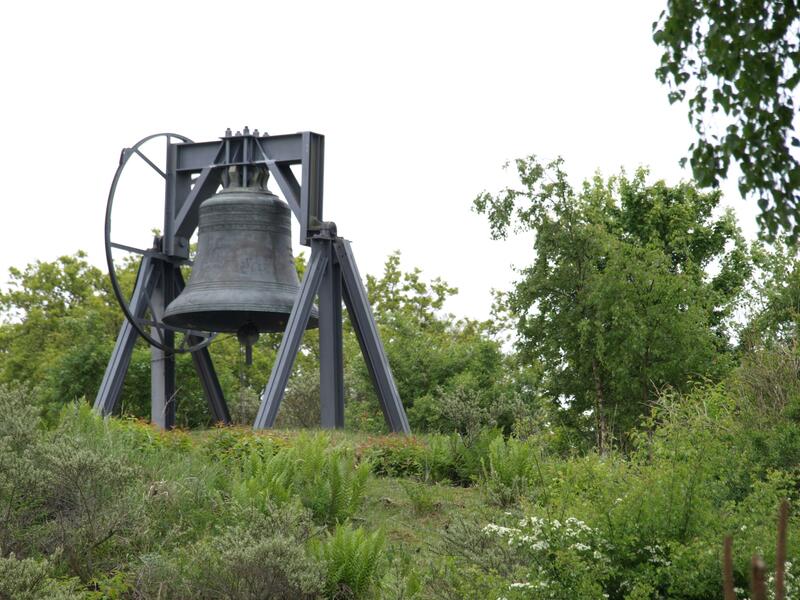 On a slight rise overlooking the simple memorial there’s a huge Bourbon bell. From the time that the procession arrives from the entrance to the park, at about 19.40, groups of people slowly toll the bell by pulling on ropes attached to the four corners of the bell support. At 20.00 the bell is silenced, the ‘Last Post’ is sounded and this is followed by a two minutes silence. The national anthem signals the end of the two minutes and then the assembled people place their tributes. Whilst they are doing this the big bell sounds out its deep, bass tone and tradition holds that the bell will continue to toll as long as there are people still waiting to place their wreaths or flowers. The ceremony normally finishes between 22.00 and 23.00. This is not a mass event the way that some of the national memorial services tend to be, with their so-called ‘dignitaries’ in attendance, but there were just a few short of 4,000 people at the event in 2013. Although May 4th is a special event the site is accessible all year round. Click here for a short video of the ‘Remembrance of the Dead’ day in 2013. From Station The Hague Central Station take bus 22 going in the direction of Duinzigt. Get off at stop ‘Waalsdorperweg’ (13 minutes) and then on foot (about 10 minutes), heading in a generally north-easterly direction. There are 4 buses an hour.